The Mi’kmaq-Wolastoqey Centre (MWC) at the University of New Brunswick held the fourth annual Gwen Bear Memorial Lecture: “Celebrating Language Carriers” on Jan. 28. UNB’s first Elder-in-Residence, Gwen Bear was an avid speaker, language and culture teacher; one of her great ambitions was to see more youth speaking the Wolastoqey language. Previous lectures have featured speakers and former students whose lives were significantly influenced by Elder Gwen Bear. 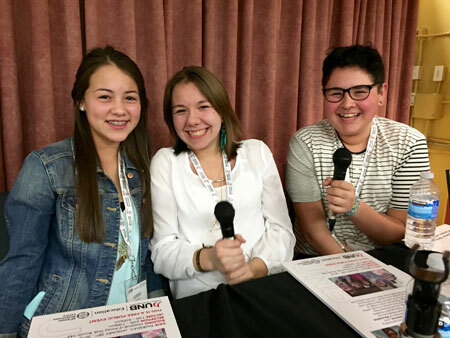 This year, the lecture featured four young language carriers from Kingsclear First Nation, who shared their experiences of authoring and illustrating Weyossisok, a storybook written in the Wolastoqey language. Baillie Sacobie, Theo Polchies, Amber Solomon and Brooke Sacobie along with their former middle school teacher, Megan Young-Jones began working on the book in 2013 as an entrepreneurial project. Over 400 copies of Weyossisok have been sold so far. The authors have decided all profits from the book will be donated back to the community school: Wulastukw Elementary. They want to ensure that children from Pilick have plenty of books to read and sports equipment to use. Anyone interested in buying a copy of the book can contact Megan Young-Jones at megan.young-jones@nbed.nb.ca.